It was about Maui, a demigod I’ve been learning about for as along as I can remember. Near and dear to my Hawaiian heritage, I couldn’t not watch it. Moana is the daughter of an island chief destined to rule the people someday, but she also has her own destiny waiting for her. A darkness is slowly creeping up on her people, threatening their way of life. 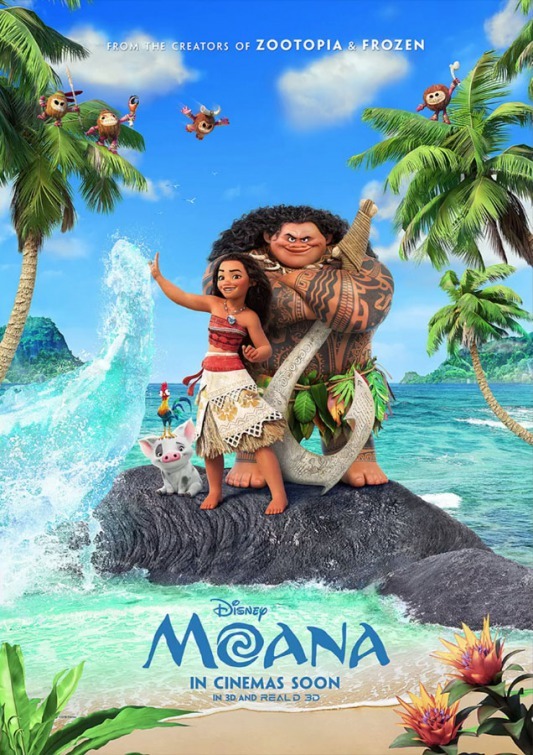 What used to work for them in the past isn’t working anymore and against the wishes of her parents, Moana sets off to chase a legend in hopes to restore nature’s balance. From the moment I heard about this movie, I wanted to watch it. Growing up in Hawaii, which is part of the greater Polynesia, Maui was definitely a part of our story-telling culture and definitely a part of the ancient religion of the Hawaiian people. I was so curious to see how this childhood story and my local culture would translate to the big screen. I love this story! I was about to type that the plotline is nothing new, but then again, what story is actually new, you know? Hasn’t all stories, at one point another, been told before? This plot is packed with adventure and true to Disney’s style packed with a fun soundtrack. I love the telling of the story and the focus on kupuna and the knowledge of our elders. Family history has always been a big part of my life (and partly responsible for the history geek in me) so to see that being a huge part of the story had me smiling for most of the movie. You have a young woman who’s trying to save her people. She accepted responsibility for her people and she had to be brave enough to break tradition. Do something different to ensure survival. You cannot help but be a little curious to see how this story played out and it’s done well in this film. It moves along nicely and doesn’t drag on, too much. I love how the Polynesian culture was presented. Mostly, I love that it raises questions about our culture. It allows an opening for discussion and I love the opportunity to do so. I’ve had people ask me how I feel about it since I’m part-Hawaiian and I’ve got no complaints. I’m sure Disney stayed as true as they could to certain parts of the legend, but I also recognize the fact that this is a fictional story and not a documentary so there may things that contradict what I know. And that’s okay. As mentioned, it allows our culture to be open to discussion and gives me a chance to talk about my Hawaiian heritage, what I know of it. Dwayne Johson and Auli’i Cravalho did a great job adding personality to Maui and Moana, respectively. The rest of the cast of characters were also done well. Family is an important part of the culture and to see Moana’s grandma guiding her through her decision, ensure that she was aware of all pieces of her ancestry, that was awesome to see. Well done. Of course this is a must watch, must add. It was well worth seeing in theaters and I would be happy to add it to my library because it is definitely a movie I’d watch again and again.